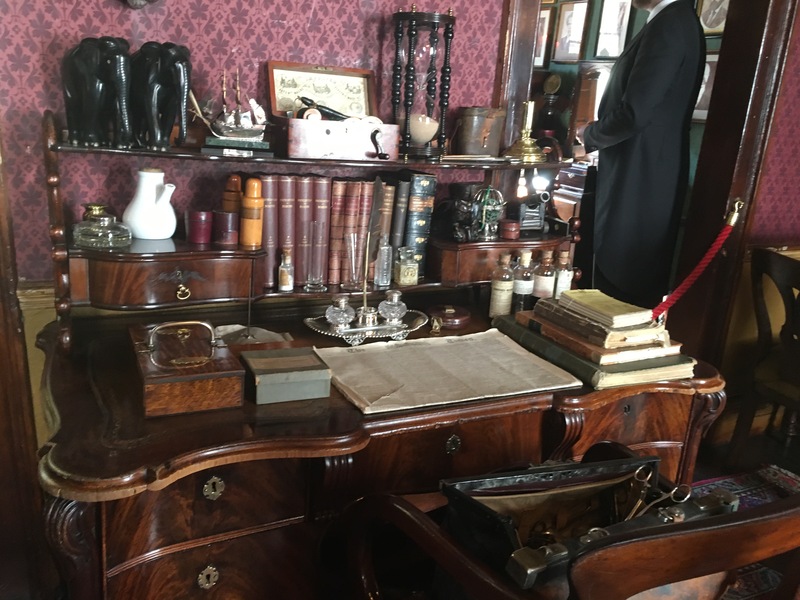 My mother and I have been fans of Sherlock Holmes–both in book and BBC form–for years, so visiting the Sherlock Holmes Museum was high on our list of priorities for our trip to London. Located at the actual address of 221B Baker Street, the Sherlock Holmes Museum was founded in 1990 as an homage to the famous fictional detective created by Sir Arthur Conan Doyle. The museum is currently run by a non-profit organization called the Sherlock Holmes Society of England and is located in an actual Georgian town house. The Sherlock Holmes Museum may be small, but it is packed with objects dating back to the time when Sherlock Holmes and John Watson would have been alive. 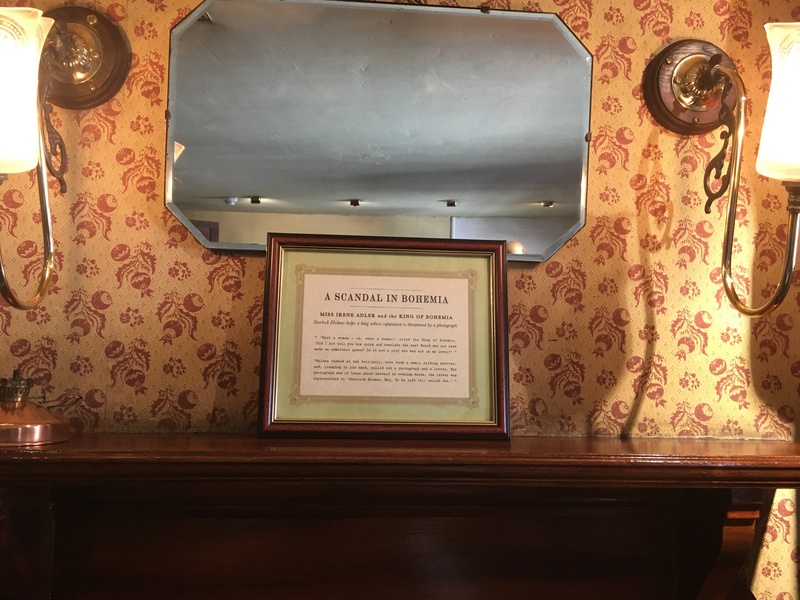 There are several rooms to explore, including the iconic living room, Holmes’s bedroom, and various other spaces filled with knickknacks and unexpected artifacts. 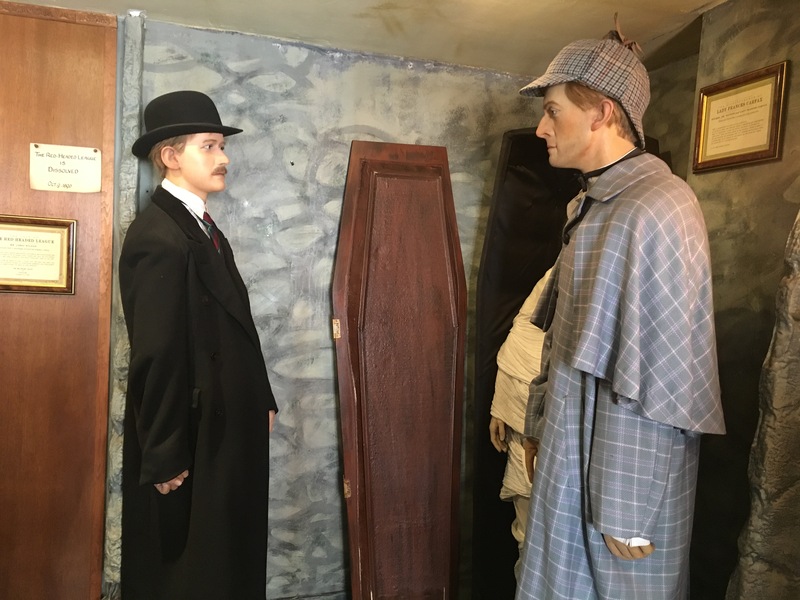 One floor of the museum is nearly entirely dedicated to wax figures of characters from the Sherlock Holmes stories, as shown by the photo below of Holmes and Watson. (As someone who is not a fan of wax figures–they’re so creepy!–it’s safe to say that I didn’t spend much time on that floor.) The tour of the museum is a mix of guided time with speakers that tell you about the artifacts as well as time for you to explore on your own. After exploring this museum, it’s easy to forget that Sherlock Holmes wasn’t actually a real person. The tour guides are careful to explain that while the objects are from the time that Sherlock Holmes would have been doing detective work in London, they obviously were not owned by Sherlock Holmes himself. However, it’s hilarious and so much fun to walk through this museum as though Sherlock and Watson did actually exist. The attention to detail is impressive, as is the effort to incorporate as many references to the Sherlock Holmes stories in these rooms as possible. It makes me want to finish reading all of the stories, which is something I’ve been promising myself for years that I would complete. 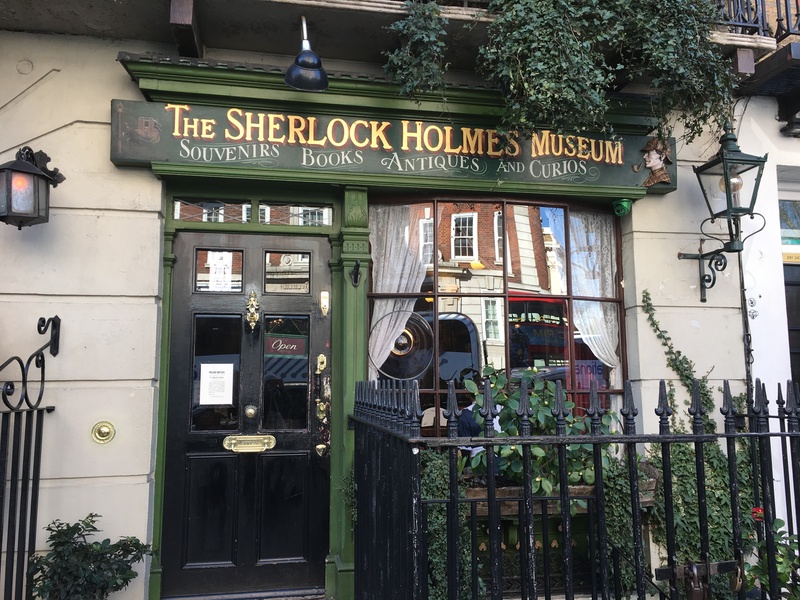 While my mom and I had a blast at this museum, I would add in a disclaimer that the rather costly price (fifteen pounds per adult) is only really worth it for avid Sherlock Holmes fans. Without a passion for Sir Arthur Conan Doyle’s fiction, I can imagine that this museum would appear rather boring and uninteresting to the average person. All in all, I would highly recommend the Sherlock Holmes Museum to anyone who loves the Sherlock Holmes stories, modern adaptations of the texts, or detective fiction in general. Besides, it’s worth it for a trip to the iconic Baker Street itself! To learn more about the museum, check out their website here. Have you ever visited the Sherlock Holmes Museum? Are you a fan of the stories or any modern adaptations of them? Let me know in the comments section below! Aren’t price hikes the worst?! I didn’t go, but I think if you like something the price doesn’t matter. I went to the Warner studios and I loved it, money well spent haha. I was thinking to travel to Oxford, but I don’t know if I’ll have the time, I’m leaving this Thursday. Yeah, once it’s ok, twice I don’t know. Maybe the next time, I want to visit Scotland again, I loved Edinburgh, like I fell in love with the city. I went there a few years ago. I’m not a huge Holmes fan, but I love the Victorian era, so it was fun to see a house set up like it would have been back then. I don’t think I paid £15 to get in. I think it was closer to £10, but that was a few years ago. I grew up watching the Sherlock Holmes tv show starring Jeremy Brett. I liked the first couple of seasons of Sherlock, but the fourth was…..hm. I didn’t like that one as much. I’m with you on the fourth season of Sherlock. I feel like the series peaked at season 2 and hasn’t been able to bring it back up to that level yet. this is awesome such a nice little way to kill a few hours, i love a good museum! Glad I’m not the only one who felt that way! 🙂 I can’t wait to read more of the Sherlock Holmes stories now–it’ll be fun envisioning that museum as 221B Baker Street! I love Sherlock Holmes and his stories. I really enjoyed the recent tv series Sherlock portrayed by Benedict C.
I’m so glad you had such a great time at this museum – but wow, it seems a bit pricey if you’re not such a big fan! Wow. I’m a huge Sherlockian, so I wouldn’t care how much it is, because by the time I get to England I’ll probably be rich. It’s a shame that the Sherlock wax doesn’t have curly black hair, though. I thought 221b was a bank and they had someone answering all the letters to Sherlock. Do they have someone who does that? Oooh, too cool! I have plans for a UK trip come August. Must visit here!! Looks like fun! But yeah that is quite a steep price.